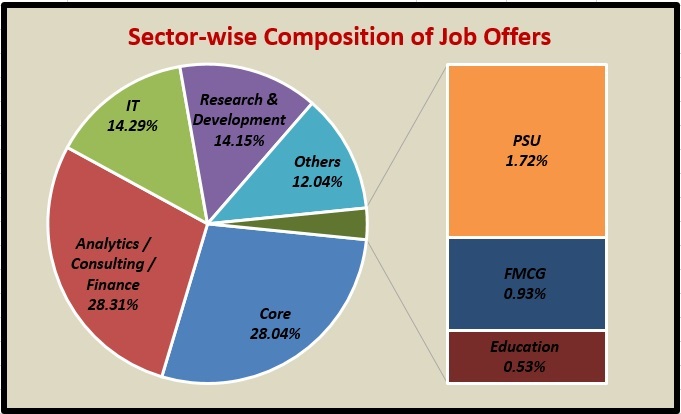 In the second part of the placement report, we look at sector-wise composition of job offers & profiles, day-wise composition of job offers & profiles and preferred sectors across departments & programmes. Find the first part of the report here. The rescheduling of the placements affected the companies as described before, but how did they really affect the students? Those who had not prepared well enough got an extra month to prepare while a lot of students were under tremendous pressure to get a good job seeing that their comrades from other IITs had bagged good offers. However, as we can infer from the above statistics, placements have been quite good at IIT Madras this year, and have improved in terms of certain parameters as well.